Potato pancakes make a perfect breakfast for night owls or early birds, as you can whip this easy batter recipe up first thing or make it the night before. 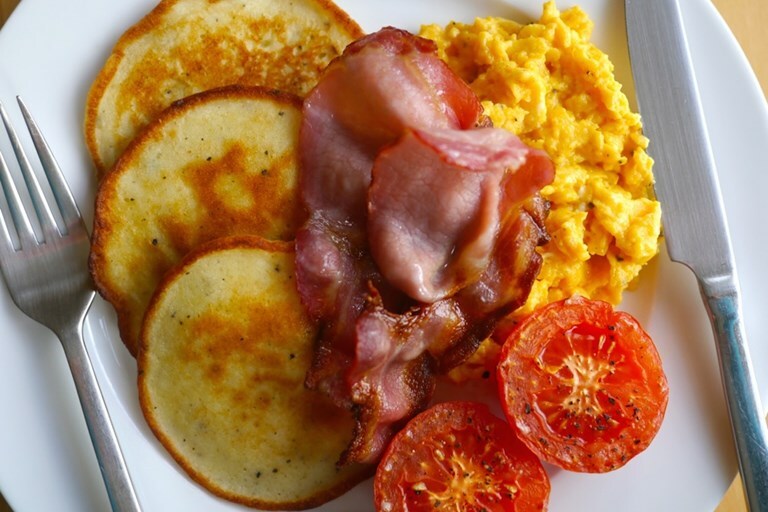 Either way you will have tasty, gluten-free pancakes ready to serve with your full English, or some scrambled eggs and smoked salmon. I am not one for skipping breakfast. In fact, I’m not one for skipping any meals, unless forced by painful circumstance. But, I know that for a lot of people, breakfast can be the most boring meal of the day. You wouldn’t eat the same thing for dinner, day in and day out, for years (or possibly decades) on end, but breakfast is often a different story. Perhaps it’s time to mix it up a bit and try something different. I’m not going to lie to you. My breakfast routine is extremely Marmite on toast-heavy, especially when it’s cold outside. I would rather hide under my duvet for an extra 15 minutes than get up to make more of a meal of my breakfast. I am not a morning person. I am, and have always been, a night owl and, as such, the mornings find me growling, bleary-eyed towards the kettle, stumbling into things as I struggle to reach a conscious enough state to navigate my way to the bathroom. This is why these pancakes are perfect for owls and larks alike, as you can whip the batter up first thing or make it the night before and leave it in the fridge until morning. These gluten-free potato pancakes are as tasty as they are filling and can make use of the silly little bit of leftover mash from last night’s supper, that isn’t quite enough for a whole extra portion, but feels too wasteful to scrape into the bin. I served my potato pancakes with bacon, scrambled eggs and grilled tomatoes, but they are wonderful with a simple blob of crème fraîche and a slice of smoked salmon or the scooped out flesh of an avocado with some spicy salsa. You can even go sweet and opt for sliced bananas with a dash of honey and a sprinkling of chopped nuts.